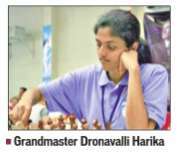 Grandmaster Dronavalli Harika missed out on winning opportunities and bowed out of the World Women's Chess Championship after losing the 10-minute tiebreaker against Mariya Muzychuk of Ukraine in Wednesday's semifinal. Harika missed her chances in the first game of the second set of tie-break games and was outplayed in the second game to lose 0.5-1.5 in 10-minute chess. Harika was unlucky not to win the first game of the 10-minute game. Playing white, the English Opening led to level middle game, but Harika picked up her pace in the queen and Bishops endgame. After winning a couple of pawns, Harika was on course to victory but an incredible blunder on move 83 saw the advantage evaporate.